Experience True Downeast Maine... 25 Miles Beyond the End of the Earth! Stonington is anything but a Maine tourist town. Lying at the tip of the Deer Isle peninsula along the Maine Coast on Penobscot Bay, tourists would have to target this off the beaten path fishing village as their destination to find it. Most travelers have their eye on Bar Harbor and Acadia National Park, another hour and a half north. But Stonington, which lies some 86 miles northeast of Portland and 173 miles northeast of Boston, has charms that few gentrified coastal towns have these days. I asked a Downeaster how far away Stonington was, and his answer was a blunt one: "You go to the end of the E'th," he said, "and it's 25 miles FUH-THUH!" Drive down Route 172 from the town of Ellsworth, and you'll know he wasn't kidding. You'll pick up Route 15 in Blue Hill, a town that has several bed and breakfast inns and an upscale restaurant or two. But you still have some serious traveling to do for the next 45 minutes. It's not until you reach the panoramic view of Eggemoggin Reach from Caterpillar Hill in Sedgwick that you see the old, narrow suspension bridge you'll have to drive over to reach the long causeway that leads to Little Deer Isle and then Deer Isle. Stop here during autumn, and the hill stretching down to the waters has turned a bright red. The blueberry barrens are vibrant before turning a sullen brown for winter. Take a small road east out of the town of Deer Isle to visit Nervous Nellie's Jams and Jellies, or visit Haystack Mountain School of Crafts. This artists' colony is located where the gravel ends in the town of Sunshine. You can also take another road west to the village of Sunset. From Deer Isle, you'll still have to travel south to finally arrive at Stonington. The town, formerly known as Green's Landing, was incorporated on February 18, 1897 by the Maine legislature. Besides fishing, Stonington was known for Deer Isle granite, but the quarries have long since closed. Stonington is still a working harbor town, though, and that's particularly clear early in the morning. 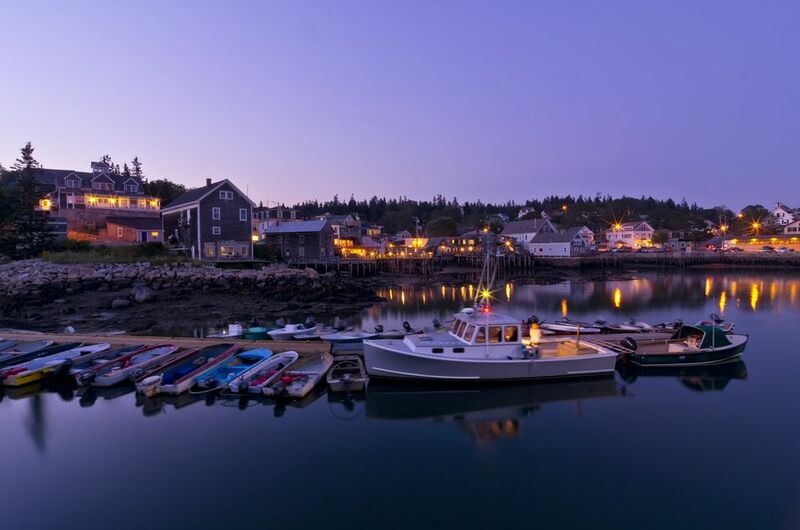 From a vantage point overlooking the water, you can see the lobster boats awaiting their morning runs, and warm light spills onto the picturesque town. The streets rise steeply from the harbor, up past the Stonington Opera House, to still more houses high on the hill. Lobster traps can be seen everywhere along the docks, a constant reminder that this is where the delicacy that lures visitors to Maine is harvested. Those who work the seas are honored each July with a special Fisherman's Day celebration including wacky rowboat and codfish relay races. Though tourism is still in its infancy here, there are some fine places to dine, like Fisherman's Friend, Aragosta and the Harbor Café. There are also some galleries along the narrow main street. Stay at the Inn on the Harbor, formerly the Captain's Quarters, for the best water view, or find bargain accommodations across the street at Boyce's Motel. The Harbor View Store has all the supplies any mariner would need. Visitors with island wanderlust can catch an excursion boat for a cruise to surrounding islands, including Isle au Haut, which is part of Acadia National Park. Get out on the water in a sea kayak, and explore the many inlets and coves. Or just take in the incredible ocean views. This is truly the Downeast Maine of legend. See it now before it becomes the Downeast of yesterday.